My first commission (pro bono) is compete. 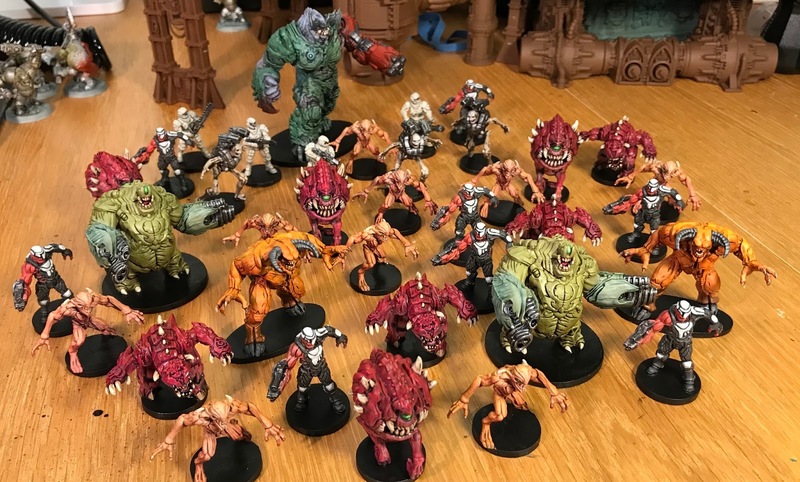 These are figures from the Doom boardgames, painted for a co-worker. They are not quite what I'd call good table-top quality; speed was the most important factor in getting these done. But I am happy with the result, given what I set out to do. Delivered the finished set about 2 hours before game time! The big figures where the most fun to do, mostly because these guys had the most detail in the sculpts. A co-worker asked me if I'd paint some boardgames pieces for her. I said sure. 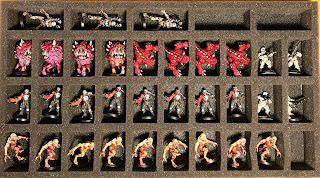 So, the game is Doom, and I started with 4 sample pieces just to see if the style was what she was looking for. First, prime and highlight for pre-shading. Next, some airbrushed colors to get tone right, and some initial paint down. 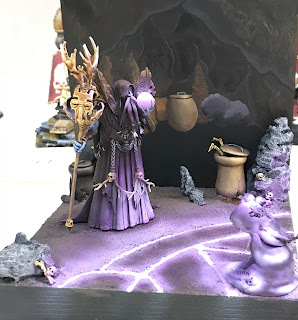 Tightened up the colors, applied washes, final details, and 4 quick table-top-ready figures are out in a day. Quick and fun. If she likes them, I'll do the rest of the set. 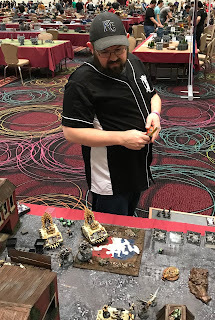 Last weekend I was down in Vegas for the LVO tournament. There was a huge contingent of Edmonton players there, along with a several wives. Here, Garnett, Carolyn and Kimberley are doing what Canadians do in Vegas...checking their phones. 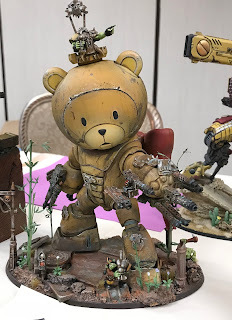 Lot of beautiful armies on display during the show. 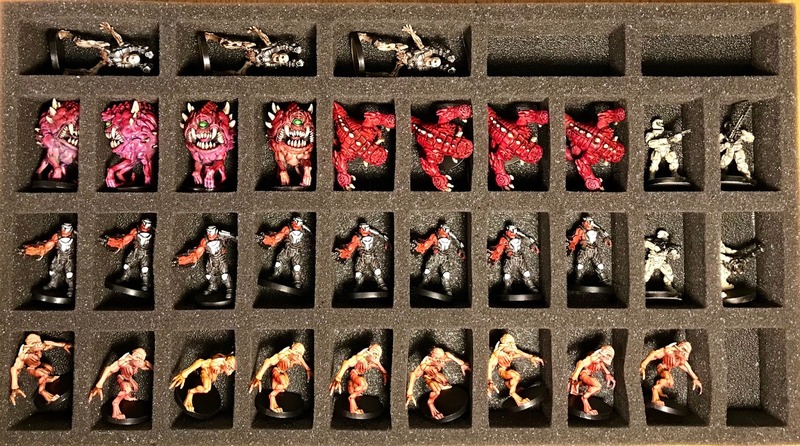 Including Lizardmen. 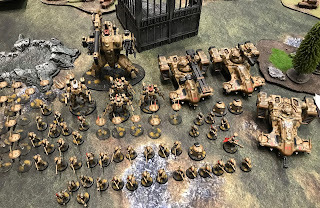 The winning painted army at my 40K Friendly tournament...more Chaos. Tau. It went on an on. 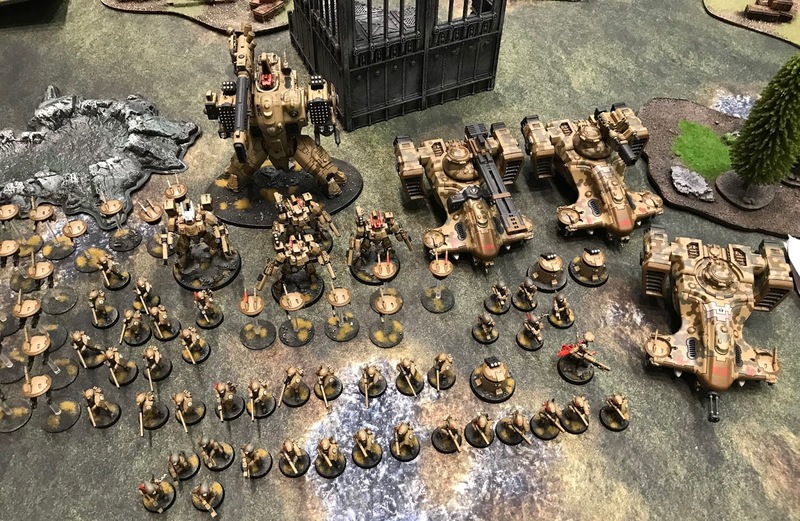 So many great looking armies. The rear interior bay was completely modelled out, and lit with LEDs. This OSL piece tickled my fancy. 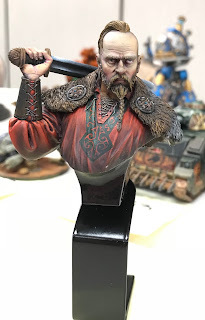 A great looking Rus Prince bust by Edmonton's own Steve Lind. I played four games in the tournament, over Saturday and Sunday. All great opponents and very fun games. Played first against Brigt from Norway. Orcs. 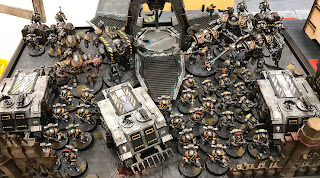 Next was Sunny and her Grey Knights army. Sunday morning I played Robert from Kansas City. He had a Sisters of Battle army, and I spent the whole game killing, and re-killing Celestine. But I did get her. 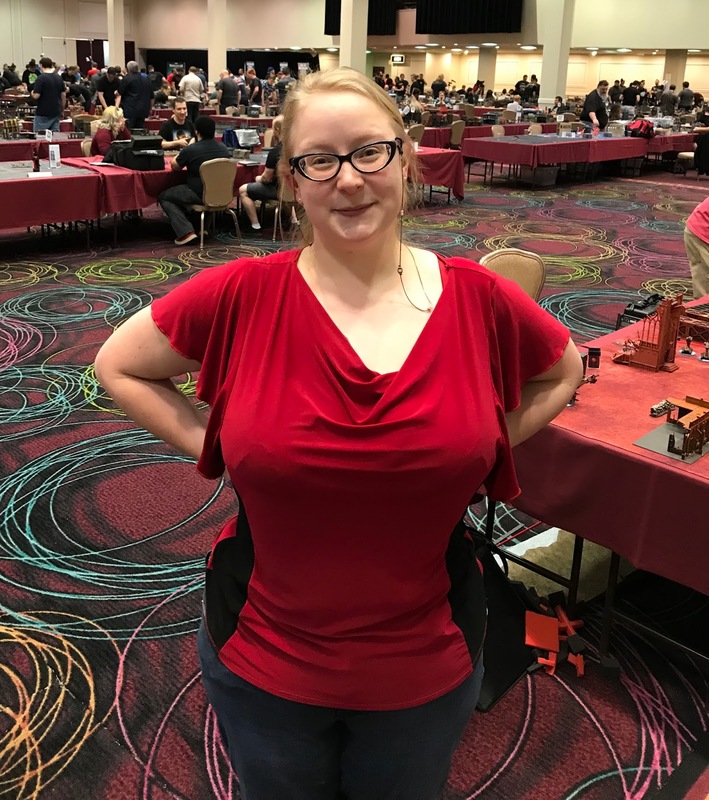 Finally played against Josh and his Khorne army (Cult of the Brass Bull). 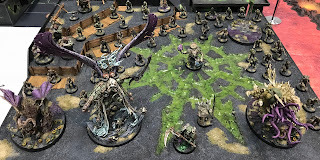 Very fun game, and first time playing against Chaos. 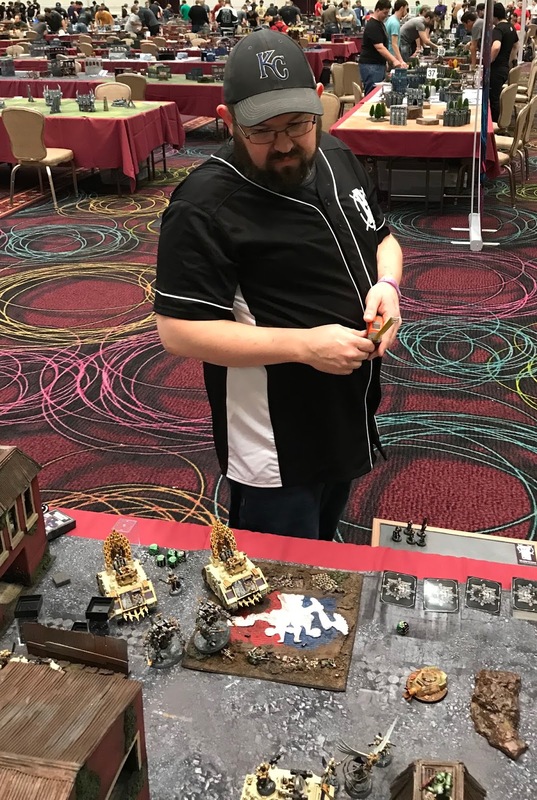 Action shot from that last game. Dark Angels in close with Khorne. 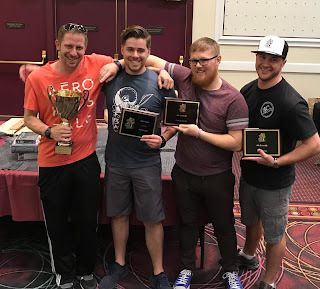 The winning group from our 40K Friendly tournament. 60 players strong, and I tied for 8th place...so pretty happy with my first 40K tournament experience.